While ATRA relies on donations from its financial supporters, We are also in need of people who are willing to donate their time. This could be something as little as helping answer the telephone for questions on up to handling applications, fostering, transporting or coordinating a state. We are always on the look out for new ideas and new people to help. If you have asked yourself what you could do to help Airedale rescue, why not be an ATRA Aire Angel! We always welcome volunteers who can foster, transport and do home visits. These are important and necessary tasks needed by any rescue group. But there are so many other ways you can help as well. Let’s explore what ATRA volunteers can do. Foster an Airedale This is a task for someone who has space in their home and family to bring in an Airedale on a temporary basis. Some of our Airedales need to learn social skills and house manners. Others need to learn what love is, that food is plentiful and that humans are caring. 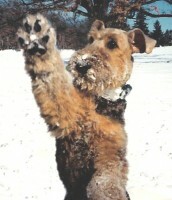 The foster family is involved in the placement of the Airedale. ATRA pays for any veterinary care and training needed. Fostering can be very rewarding and those who do it usually want to do it again. You can make a difference. Any questions you may have can probably be answered by going to "Foster for ATRA". Transport an Airedale Because of the large area we cover, we depend on volunteers to help transport our Airedales from state to state as well as within states. ATRA not only has volunteers willing to drive, we also have volunteers who fly Airedales using private airplanes. ATRA’s Transportation Coordinator handles all of the arrangements for long distance transports. All you need to do is let us know you would like to be on our transport list as a possible contact for any transports coming through your area. For answers to questions you may have about transporting, go to "Transport for ATRA" in the Library. Do home visits ATRA screens each of our applicants as part of the approval process before we place an Airedale with them. We check vet and personal references. We also visit them at their home. Many of these applicants are spread throughout our area and we rely on volunteers to do the home visits. ATRA provides a checklist that outlines the questions to ask and what we are looking for. If you would like more information about doing home visits go to "Helping with Home Visits". Work on a committee ATRA has several committees set up for our main fundraisers and seminars in addition to several other smaller tasks. A brief description of each committee can be found on the "Committees" page. Go to the "Volunteer Network" to find contact information for these committees. Other ways to help Many people we talk to do not have the time to volunteer in one of the ways listed above. If you are one of these people, you can still help in countless other ways. Use your imagination and do something that might not take much time or effort, yet it would make a difference. The Airedales are counting on us. For our volunteers Our volunteers are ambassadors for us when it comes to getting the word out about ATRA, so we send each volunteer a packet to help them do just that. Each packet contains a window sticker for volunteer vehicles sporting the words “Ask me about Airedale Rescue” and an “Aire Angel” volunteer pin, along with a few business cards, ATRA pamphlets and “Wanted” posters. Sign up now! If you would like to join the ATRA family of volunteers, click here to see descriptions of the positions available and click here to fill out an application.